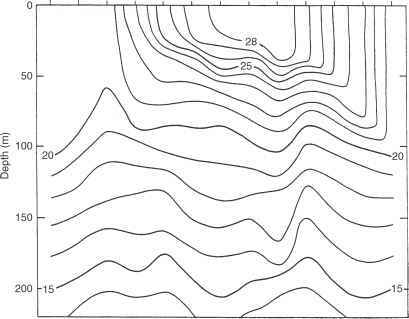 Figure 3.17 Temperature contours (°C) for a region of the Texas-Louisiana continental shelf in the Gulf of Mexico (Etter and Cochrane, 1975). for example, the mixed layer is approximately 100 m deep while in August the MLD is seen to be shallow, about 25 m. These variations are further illustrated in Figures 3.18 and 3.19, which are vertical sections across the shelf. 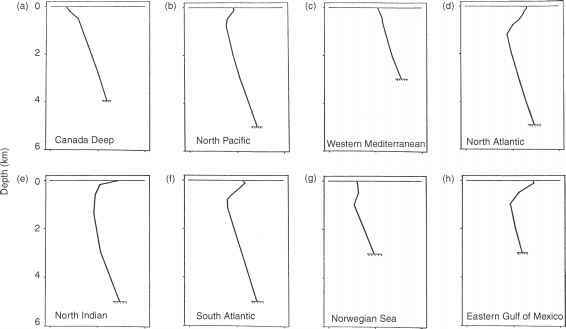 In winter (February), for example, the isotherms tend to be vertically oriented, evidencing strong mixing and vertical (versus the more typical horizontal) stratification. In summer (July), however, the isotherms tend to be more horizontal, the result of weak mixing, with attendant horizontal stratification.